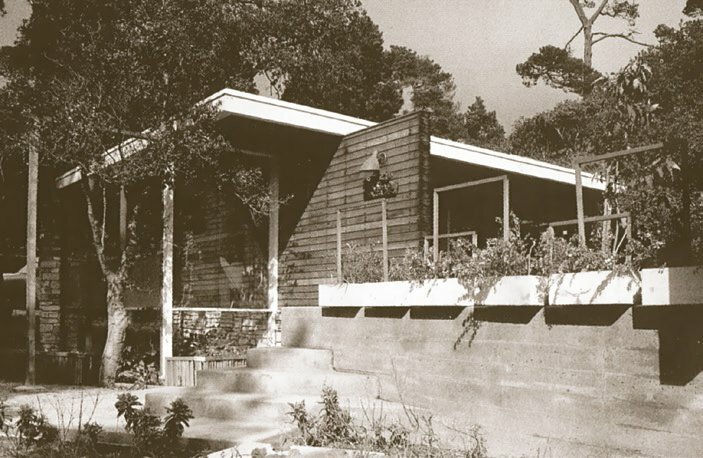 Henry Hill and the Appert house, Portola Valley (1959). There can be a sameness among the homes created by the Northern California mid-century modernists—which, in a way, was almost the point. Their goal in building homes wasn't to blow people away with starchitect creativity. They wanted to create low-cost homes that could be built easily and, ideally, could serve as models for low-cost tract homes. These were modest modernists. 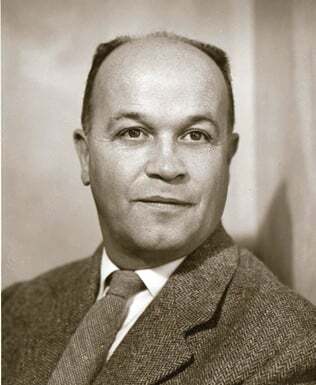 Hill (1913-1984), born in England but raised in Berkeley, created several compact 'Peanut' houses that were essentially a single room, with the sleeping area overlooking the living space. Still, the Peanut house in Kensington came with a gold-leaf fireplace and one wall of purple. More than most of his compatriots, Hill was a sensualist—and theatrical. From boyhood he created theater sets, and did so again in retirement for an outdoor theater in Carmel. His homes are lively, funny, and with touches of exotica—like the indoor pool in an El Cerrito home surrounded by mosaic walls and with an outrigger canoe above the water. Hill was one of the handful of Bay Area modernists working before World War II. In junior partnership with John Dinwiddie he collaborated with the European modernist Eric Mendelsohn. His training included Bauhaus principles, as Hill got a masters in architecture at Harvard under Walter Gropius. A Hill house, which can look like a redwood box from outside, is filled with texture and color, slats, latticework, hidden lights, grass-cloth walls, and surrealistic light fixtures created by his friend Karl van Hacht. Hill often used plywood for walls and ceilings, sometimes sawn to create more texture. The play of space in a Hill house can be delightful, even suggesting a funhouse. Visitors moving through the El Cerrito house can have trouble knowing exactly where they are, thanks to angled walls and mirrors. Hill took his designs seriously and was known to walk away from jobs when the client demurred. "He had high ideals of what he wanted to do," his boyhood friend Jack Lund said.